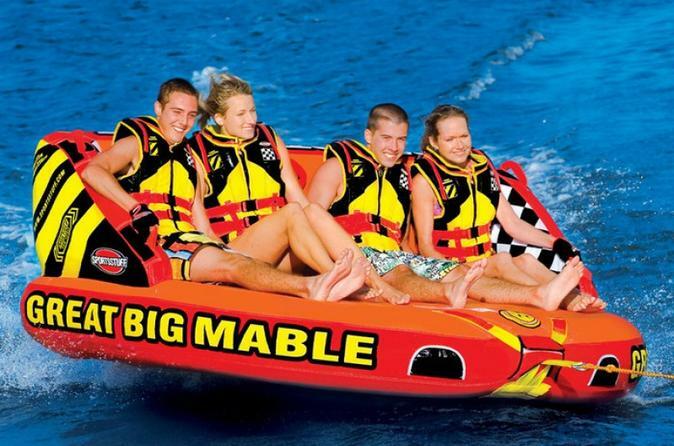 Take a thrilling ride on a Banana boat as it's probably the safest and most fun water sport you will ever try! After a quick boat ride to an island in the middle of Miami's bay you will be given your life jacket, asked to sit down into the sofa-like inflatable tube and be taken for a ride you'll never forget by a certified instructor! Make sure to tell them if you are a daredevil or just there to enjoy the ride! This activity is awesome for an adrenaline tour of the bay as it includes both a boat transport and a water sport activity! Fun and life time memories are guaranteed! Once you arrive at the departure location, there will be a boat ready to take you to the nearby island. This is where your boat captain and instructor will be expecting you. The Island is a beautiful oasis with its sandy beach over looking downtown. After a quick introduction you will be fitted with a life jacket, ask to sit down into our inflatable tube and simply grab-on! Your instructor will pull you around Miami's bay for an adrenaline rush of a life time! Once your activity completed the boat will take you back to the Marina where you can change and rinse off.